30 May 2018 2 p.m. – 4 p.m.
Across a variety of settings, the outcomes of economic competition reflect the normalization of individual values of certain economic quantities by average or social measures of themselves.The resulting socioreferential processes establish systematic interdependences among individual values of important economic variables, which under certain conditions take the form of emergent first-moment constraints on their distributions. The paper postulates a principle describing this systemic regulation of socially scaled variables and illustrates its empirical purchase by showing how capital- and labor-market competition can give rise to patterns of social scaling that help account for the observed distributions of Tobin's Q and wage income. The paper's discussion embodies a distinctive approach to understanding and investigating empirically the relationship between individual agency and structural determinations in complex economic systems and motivates the development of observational foundations for aggregative, macrolevel economic analysis. 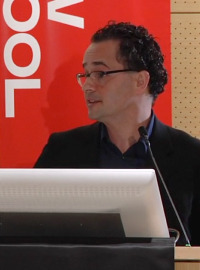 Paulo dos Santos is Assistant Professor of Economics at the New School for Social Research. His research program involves Classical Political Economy; Banking and Monetary Theory; and the role of Finance in Economic Development. Paulo's current work inquires into the distinctive social and macroeconomic content of contemporary financial practices and relations. His interests include also methodological issues in economic analysis, including the appropriate use and interpretation of mathematical formalisms. Open to all and free of charge.